Recent studies on Latin linguistics have two essential and complementary foci : sociolinguistics and pragmatics. Such an extension of perspective is due, at least in part, to the collection and analysis of data pertaining to non-literary texts that witness to linguistic forms not compatible with the normative tradition of Classical Latin. In particular, in the last few decades the discovery of new materials (tablets, ostraca, inscriptions) has opened new prospects for the multi-hued reconstruction of this dead language. The challenge is the reconstruction of a linguistic system resembling that of the living languages of our contemporary times, mutatis mutandis, of course. To look at Latin as a spoken language necessarily implies acknowledging the occurrence of linguistic variation relative to all levels of the ‘grammar’. Every human society, even the most archaic, shows linguistic variation according to the social class of the speaker, his education, and the communicative context in which speech acts occur. According to a widely shared line of research, a sufficiently plausible frame of sociolinguistic variation for Latin may be approached, especially with regard to the stylistic (or diaphasic) dimension (Winter, 1998, Müller 2000, Adams, 2007, 2013, Clackson 2011b, Hernández Campoy and Conde Silvestre 2012, Marotta 2015, among others). A quite heated debate on the value of epigraphic data has absorbed the literature devoted to Latin language (Herman 1990 ; Adams 2007 ; 2013 ; Clackson & Horrocks 2007 ; Clackson 2011a). Different and sometimes contrasting viewpoints have been proposed over time, especially in the studies aiming at reconstructing the sociolinguistic framework of Latin. Scholars still disagree on the value to be assigned to abnormal (i.e. non classical) spellings occurring in inscriptions. Are they clues suggesting pronunciations reflecting the social class of the reader/speaker ? Are they simple mistakes in writing ? Are they a sign of the archaizing style typical of the epigraphic register ? 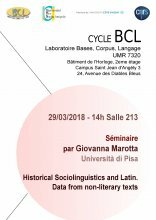 The conference focuses on some graphemic alternations occurring within CLASSES, a corpus of inscriptions of Latin language (cf. http://classes-latin-linguistics.fileli.unipi.it). The fine-grained comparison carried out on the lemmata occurring in the epigraphic corpus reveals a quite complex orthographic picture, where vowel alternations cannot be ascribable to archaism pure and simple but rather may be interpreted as evidence for sociophonetic processes sensitive to both lexical and prosodic constraints.